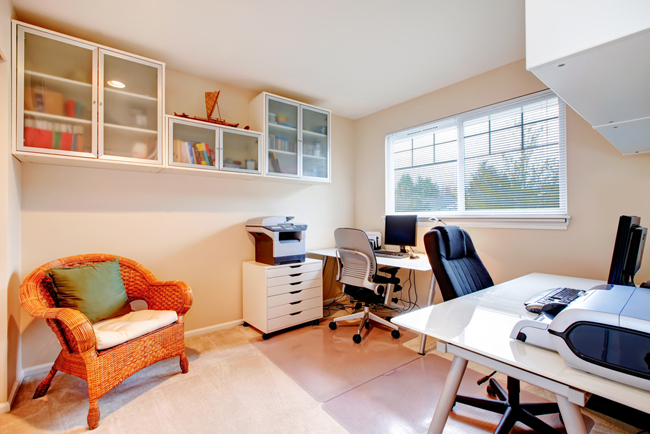 A home office should be a productive environment, void of stress and distractions. Through the use of lighting, accessories, and ergonomics, your office can easily be turned into a functional, creative space. Let’s take a look at a few tips for getting your productivity kicked into high gear in the office of your dreams. If your home allows, draw on as much natural light and pretty scenery as you can. Studies throughout the years have advocated the use of daylight for increased productivity, comfort and health, so keep at least one window close and equipped with some functional blinds or curtains. Green is also the way to go—leafy scenes and a potted plant or two nearby will help with de-stressing. To keep productive, stay comfortable. Proper ergonomics will keep the ideas flowing without adding pain and discomfort. Switch out that old office chair for one that supports the natural curve of the spine and adjust the height so that your feet are flat on the floor and thighs are perpendicular to the floor. Adjust your computer monitor so it’s an arm distance away and at eye level and keep your mouse and keyboard close for shoulder comfort. Suffering from lower back pain? Invest in a stylish office chair with proper lumbar support and cushion. 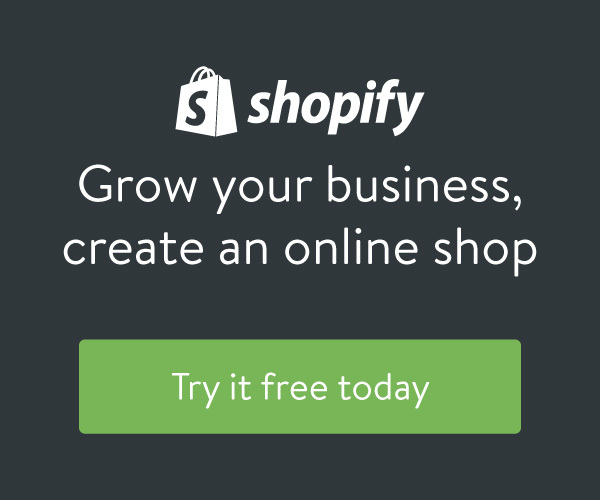 Don’t let a lack of space keep your productivity down! Invest in some extra workspace to keep the stacks of paper from piling up. A decorative console table works great for storing lesser-used books and materials that add distraction to a small work space. Consider an accent chair or a small rolling table to give you the freedom to switch up work areas and manage tasks with more clarity. Does your space have a windowsill? Maximize space by displaying a few heartfelt knickknacks or a calming plant on it, complimented by a pair of useful and decorative curtains. 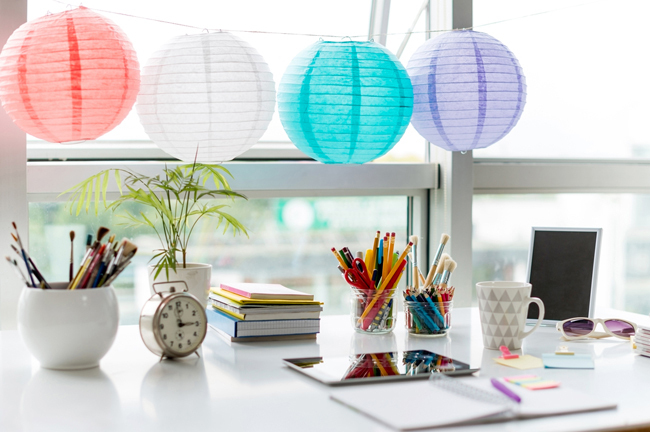 Keeping your desk clean is an obvious go-to for increasing productivity. Utilize metallic cups or glass jars for another take on tabletop storage. Keep pesky papers organized and tucked out of sight, and consider movable storage like rolling files or bins for even more flexibility. If your desk drawers are a sight to be seen, consider adding drawer organizers to keep everything in place and maximize your time. Your home office shouldn’t feel like a stale cubicle. Keep your inspiration wheels turning by surrounding yourself with the things you love. 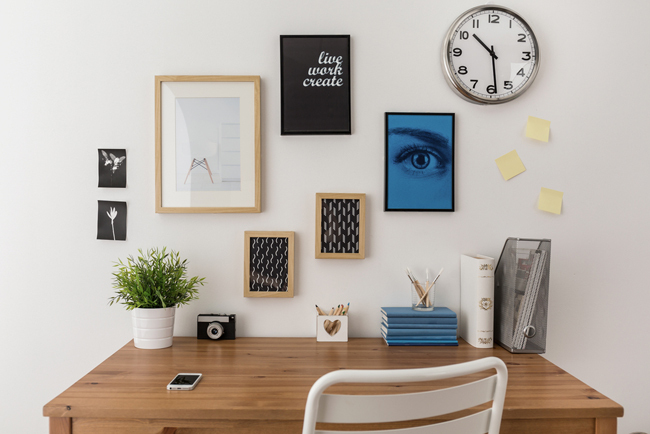 Mounted clipboards or corkboards provide a designated space for ideas and clippings without all the clutter. Hang inspiring art or photography that makes you smile and decorative curtains in a warm, neutral tone. Use additional mounted shelving or a bookcase to keep your books pretty and organized. What design elements keep you productive in your home office? Kerrie Kelly, business owner of Kerrie Kelly Design Lab and interior designer, writes about creating beautifully designed spaces. 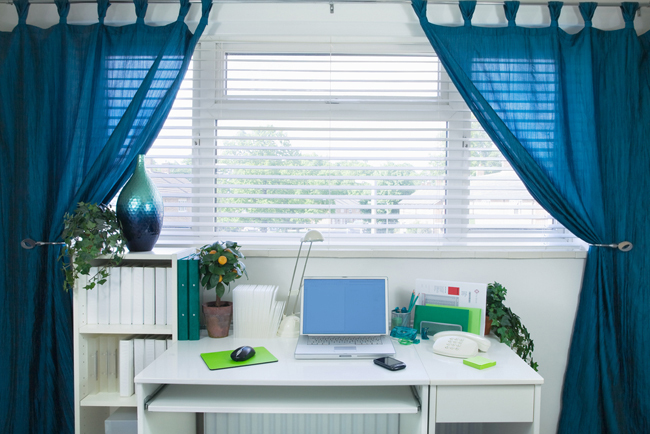 She provides tips on making a productive office space that uses window treatments to let in natural light and help keep you focused. To see a selection of drapes to outfit your office, visit The Home Depot.